Cindy McCain Net Worth: How Did John McCain's Wife Earn Her Massive Personal Fortune? As the country mourns the patriot, war hero and Senator John McCain, eyes turn towards the Arizona senate seat he has left vacant and who may step in to fill it. One name that keeps coming up is that of his beloved wife, Cindy McCain. We got to know the stunning blonde a bit during McCain's 2008 Presidential campaign. But who is the woman behind the Senator and where did her wealth come from? As we pointed out in our profile of Senator McCain, most of the couple's enormous fortune actually comes from Cindy's side of the family. Cindy Lou Hensley McCain was born May 20, 1954 in Phoenix, Arizona. Her mom was Marguerite "Smitty" Hensley. Her father, James founded Hensley & Co. She was the only child of her parents' second marriages and grew up wealthy in Phoenix. She won the 1968 Junior Rodeo Queen of Arizona title. She went to Central High School where she was named Best Dressed as a senior. She graduated in 1972. She enrolled at the University of Southern California where she was a member of the Kappa Alpha Theta sorority. She graduated with her bachelor's degree in education in 1976. She stayed at USC to get her master's degree in special education in 1978. She wrote her thesis on the role of movement therapy that laid the groundwork for the way children with severe disabilities are treated. She declined her father's offer to join the family business and took a job for one year as a special education teacher at Agua Fria High School in Avondale, Arizona. She worked with children with Down syndrome and other disabilities. In April 1979, McCain met Cindy Hensley at a military reception in Hawaii. He began dating her, while at the same time asking his wife to grant him a divorce. John and Carol divorced in April 1980. John and Cindy were married in May 1980. As Cindy was the heiress to a large fortune, the couple had a prenuptial agreement that kept almost all of the Hensley family money and assets in her name. John and Cindy have always kept their finances apart and filed income tax returns separately. Cindy's father, Jim, founded Hensley & Co. in 1955. The Phoenix-based business grew to become one of the largest Anheuser-Busch beer distributors in the U.S. Jim Hensley's business and political connections helped John McCain to get into Arizona politics. Cindy went door to door with her husband campaigning for his first bid for U.S. Congress in 1982. She was heavily involved in campaign strategy. Her family wealth helped McCain in his political campaigns as the Hensley family was able to grant significant loans to his early campaigns. When John McCain was elected to Congress in 1982, the couple moved to Alexandria, Virginia. Cindy spent two months in 1983 writing handwritten notes on 4,000 Christmas cards that were sent to constituents and others who had helped them along the way. Cindy didn't have an easy time in Washington D.C. at first as John's first wife, Carol McCain, was a popular figure on the D.C. social scene. The pretty blonde from Arizona was an outsider. During this period, Cindy had a number of miscarriages. She was homesick for Arizona. Cindy moved back to Arizona in early 1984. Meghan McCain, the couple's first daughter, was born later that year. Son John Sidney IV "Jack" was born in 1986 and son James in 1988. In 1984, Cindy took a vacation to Truk Lagoon, Micronesia, where she witnessed substandard medical facilities. That trip inspired her to found the American Voluntary Medical Team (AVMT) in 1988. AVMT was a non-profit organization that arranged trips for doctors, nurses, and other medical personnel to provide in the field emergency medical care to war torn or disaster-struck areas in developing countries like Vietnam, Kuwait, Micronesia, Zaire, Iraq, Nicaragua, El Salvador, India, and Bangladesh. In Zaire, AVMT helped refugees of the Rwandan genocide. Cindy led 55 of these medical missions over seven years. Each mission was at least two weeks long. In the spring of 1986, Cindy and her father invested $359,100 in a shopping center project with a Phoenix banker named Charles Keating. The involvement with Keating, combined with her role as a bookkeeper who later could not find the receipts for family trips on Keating's jet, caused some complications for John McCain during the Keating Five scandal. McCain faced serious scrutiny over his role in the oversight of Keating's bank. In 1991, Cindy traveled to Dhaka, Bangladesh with AVMT to provide medical treatment and relief after the devastation cyclone in Bangladesh. While visiting Mother Theresa's orphanage, Cindy met two infant girls that she strongly felt needed to be transported to the U.S. for treatment. She adopted one of the girls, who she named Bridget. The other was adopted by a family friend. In the late 1980s, Cindy developed an addiction to Vicodin and Percocet, which she began taking for pain after two surgeries on her spine for ruptured discs and to reduce the stress she felt during the Keating Five scandal. At the height of her addiction she was taking 20+ pills per day. She used an AVMT doctor to write the illegal prescriptions in the names of three AVMT employees without their permission. Her parents staged an intervention in 1992. She told her husband about her addiction and went into an outpatient facility to deal with it. In 1993, she had another spinal surgery which eliminated her back pain. Unfortunately, one of the AVMT employees discovered her illegal drug use and he was fired in January 1993. As a result, he tipped off the DEA about Cindy's prescriptions and a federal investigation ensued. As a first-time offender, her attorney was able to avoid charges. Cindy paid a financial restitution and did community service. For the rest of the 1990s, Cindy was mostly a stay at home mom raising her four children. Over the years she also held positions as vice president, director, and vice chair of Hensley & Co.
After her father died in 2000, Cindy became chairwoman of Hensley & Co. Today, between Cindy, her children, and one of John's kids from his first marriage, collectively own 68% of the company. The company does over $400 million in revenue per year and employs more than 1,200 people. Over the years, John McCain has made various public wealth disclosures that detailed snippets of the family's assets. However, in order to protect some of Cindy's business privacy, the couple actually filed separate tax returns. As of this writing, Cindy McCain's minimum net worth is $300 million. During her husband's presidential run in 2008, Cindy faced media scrutiny about her wealth and spending habits. She reluctantly released the first two pages of her 2006 federal income tax return, which showed $6 million in income for that year, $570,000 in itemized deductions, and more than $1.7 million paid in federal income taxes. We also learned that Cindy owns 10 homes including rental properties. She owns a condominium in Arlington, Virginia, an oceanfront tower in San Diego, a different property in San Diego, a $6 million condo in Phoenix, a $1 million townhouse also in Phoenix and a 15-acre ranch in Sedona, Arizona. Cindy is also an amateur pilot and race car driver. She and her kids own a minority stake in the Arizona Diamondbacks and a small collection of commercial office spaces mainly in Phoenix. John McCain's most recent wealth disclosure listed his own net worth at $16 million. What Happens to John's Senate Seat? Arizona governor Doug Ducey is responsible for choosing McCain's successor. That person must be a Republican and would hold office until a special election is held in 2020. 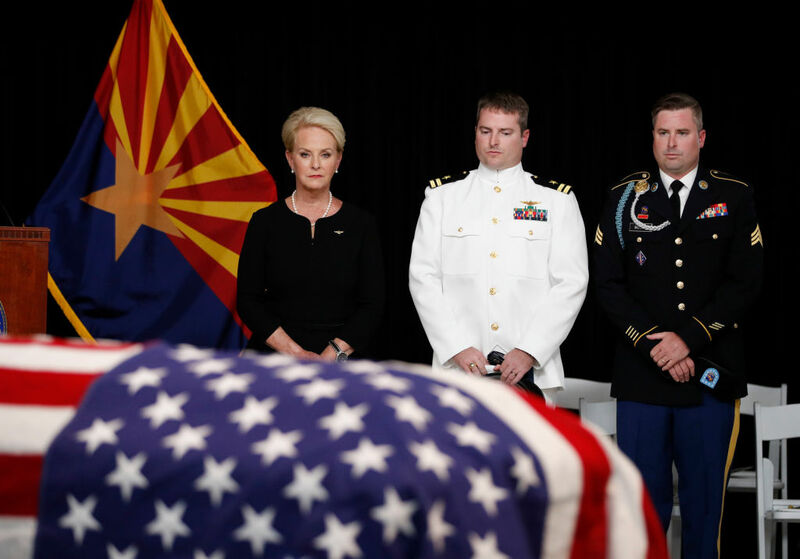 Many analysts are betting that Ducey will invoke the practice known as Widow Succession to instill Cindy McCain in her husband's senate seat. Ducey will not name a successor until after McCain is buried. But ever since he went public with his diagnosis of an aggressive form a brain cancer called glioblastoma, the possibility of Cindy McCain taking over his senate seat has been raised. If she is chosen, she would become one of the close to 50 other women to succeed their husbands in political office after their deaths.